Amidst the incredible student-led gun control movement in the US and the completely sickening slaughter in East Ghouta, the USS strike amongst (some) UK university workers seems rather unimportant. The surface cause of the strike—fighting for our pensions—sounds downright quaint even within the UK context, but it is within a landscape of intensive, predatory neoliberalism that has been eroding the UK university system for the last 20+ years. This strike action has been a rapid education for me—though I’ve been teaching in universities since 2006, my lectureship so far has basically been firefighting, with developing new courses and getting used to new responsibilities while conducting top notch research (right???) and occasionally seeing that child that I’m rather fond of. I didn’t really think I’d have to learn the specifics of my pension, the timeline of escalating student fees (beginning to understand why Tony Blair is so thoroughly despised), and the subtly different rules of protest and industrial action in the UK, but here we are. We are two days into a strike action that could potentially take out 14 days of teaching from a critical time of the student year, the end of the spring term. I’m no stranger to protest; my mother took me to an anti-nukes rally in the early 1980s, I protested the build-up to the 9/11 (forever) wars and took action in Berkeley many, many, many times, as perhaps one might expect. One of my photos of these protests made the cover of the 2010 University in Crisis issue of the Kroeber Anthropological Society Papers. The first act of civil disobedience doesn’t come easily to most people of good conscience. We are raised, with good reason, to be obedient; it requires a great deal of discernment to decide what matters enough to justify going against our more sociable inclinations to conform…. This habit of courage and willingness to engage in ‘non-violent resistance’ has weakened in recent decades, replaced by a self-interested and protectionist academic ethos. A more politically cautious faculty have followed a neoliberal notion of decorous and quiet civility…. Meanwhile, there is a resurgence of anti-intellectualism, the infiltration of corporate business models to every aspect of academic and university life, the devaluation of the arts, humanities and the social sciences, increasingly seen either as a luxury or as intellectual enemies of the global economy. The Enlightenment idea of the university as a voluntary community of teachers, researchers, and students dedicated to the open and disinterested pursuit of knowledge and learning is being rapidly replaced by the idea of the university as a corporate enterprise whose primary functions are to provide a skilled workforce and to generate profitable and usable research for industry and global commerce. Scheper-Hughes points out that, ironically, during these strike actions we actually do more teaching and admin than we would have done otherwise, through organized teach-outs, strategy meetings, and public outreach on the radio, print and television. We’ve been organizing Teach-Outs (as opposed to Teach-ins, which would cross picket lines) at our local archaeology pub who immediately and fervently declared their solidarity. I was afraid that our first Teach-Out would find me and a handful of fellow lecturers having a lonely pint, but…we had standing room only. There is a hunger for action amongst students and staff that is refreshing but honestly unsurprising. During the Teach-Out, we had questions and discussion guided by the progressive stack, a tactic used for group meetings during Occupy. Sara Perry and I had been talking about ways we could use it in the classroom, and I had written it up for review by our teaching committee. The progressive stack in the context of the Teach-Out was invigorating; POC spoke before white people, LGBTQ+ people before cishets, students before lecturers, women before men…to the best of my ability, at least. It relied on my own biases and foreknowledge, so it was (deeply) imperfect, but foregrounded voices that were critical to our discussion. We’re doing it again on Monday, and hopefully gathering momentum–getting more diversity on our speaking panel, etc. It was and will continue to be, completely exhausting. Organizing on the fly, standing out in the bitter, bitter cold, and keeping up the emotional energy left me with very little to give my family afterwards. So…basically like academia, right? Nothing good happens without struggle, without solidarity, without a readiness and a willingness to court controversy, to take risks, and to expect and to sustain retaliation…. There’s a very real chance that this, my first UK industrial action, might be the last. If it fails, a toothless union isn’t worth much, except to be laughed down by ridiculously overpaid VCs sipping “pornstar” martinis in expensive hotel suites while our precarious associate lecturers and other university workers struggle to make ends meet. It’s critically important to support the strike and to take back our universities. 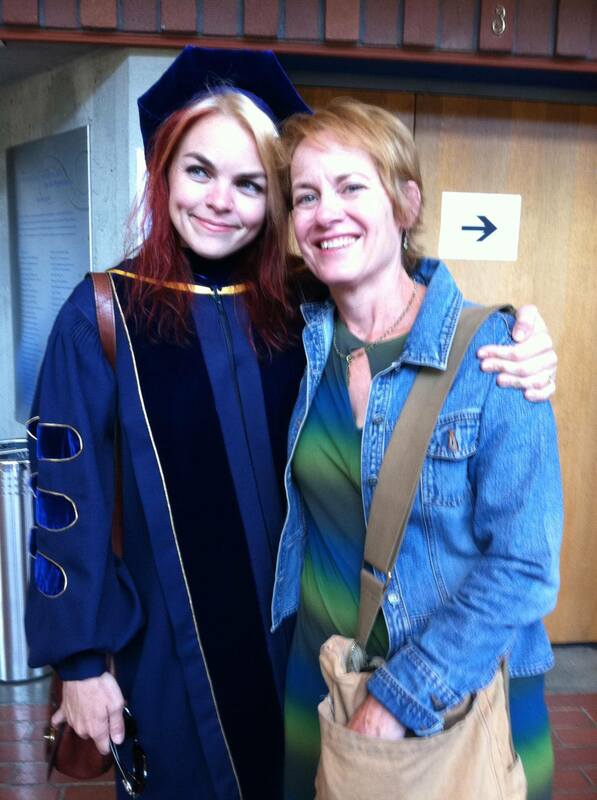 Me and my amazing mother, Elizabeth Kelly. In the years before I had the opportunity to stand in front of you in these fancy robes, I was one of the graduate student volunteers that helped out during commencement. After grading exams, teaching, securing funding, conducting research and finding time to write, graduate students are called on to help our fantastic staff today. When I volunteered during commencement, I selfishly went for the best job…the person who stands just behind and to the side of the esteemed chair of the department. This person hands the scrolls to the chair, but as I discovered, they have an extraordinary insight into the commencement ceremony. What this person sees is your face as you achieve an epic win. Jane McGonigal, famous game theorist, humanitarian and UC Berkeley PhD, class of 2006), describes an “epic win” as an “outcome that is so extraordinarily positive that you had no idea that it was even possible and that when you achieve it you are shocked to discover that you are actually capable of such a thing.” The facial expression is singular: joy, fulfillment, attainment of a goal, perhaps a little bit of disbelief and shock. After several years of basking in the glow of the achievements of both my fellow graduate students and the amazing anthropology undergrads I taught…now I get to join you. But I have to admit that I am greedy. I want that job again. I am excited by the potential to enact change in the world, but moreso by the potential of seeing other people achieve their own aspirations. Accordingly, my dissertation research was shaped by three principles: Participate. Make. Share. In anthropology we learn about the breadth and diversity of human experience and in my sub-specialty in archaeology, we acquire knowledge about this human experience through material culture. Our education is one of discerning patterns and difference, specifically, we learn how to see. My advisor Ruth Tringham would surely protest–we learn about the past through all of our senses, she would say. We touch the edges of still-sharp obsidian, we smell the dank interiors of caves, we hear the rasp of dirt beneath our trowels and the dull and hollow rattle that marks a grave. Still, this experience, this way of seeing requires your attention and participation. And that is the first principle that I learned during my studies at UC Berkeley–your full participation is required. No half-measures. Learn and live with both hands. The second principle is to make things. This may seem like a strange imperative coming from an archaeologist–great, now we have even more material culture to study–but making mudbricks at the San Francisco Presidio on a particularly chilly morning, trying to get the straw-to water-to horsehair-to mud ratio correct, hefting them, slapping the bricks together into a wall, and watching the mudbricks melt in the ubiquitous Bay Area fog gave me particular, if unflattering insights into the early architecture of the colonizers in the area. Making ethnographic movies taught me how to watch regular movies…and commercials and Youtube clips. Always always try it yourself. As part of the outreach program mandatory for Berkeley archaeology graduate students, I developed this mudbrick-making into an exercise for 10-year-olds visiting the Presidio and saw them Get It–that elusive link to the past that we archaeologists take for granted. This dovetails nicely into the final principle, which is to share. It is not enough to participate, it is not enough to make things, these things (and the insights gleaned from them) must be shared whenever possible. The default should be to share. The production of knowledge about humans is for everyone, and should be made available to everyone. Enter your ideas into the commons, publish your own book, and push to make academic journals open access. Though the process is terrifying as a junior academic, it is not only vital for the survival of our field, but imperative that we communicate our knowledge of the diversity of human experience in the face of suffering and violence enacted against alternate ways of life. What I saw as I stood behind the chair of anthropology and what I am seeing today is the realization of years of effort that resulted in a fantastic, transcendent moment. What I ask of you today is to now work toward the next epic win. Participate, make things, and share. Giants? World Series? 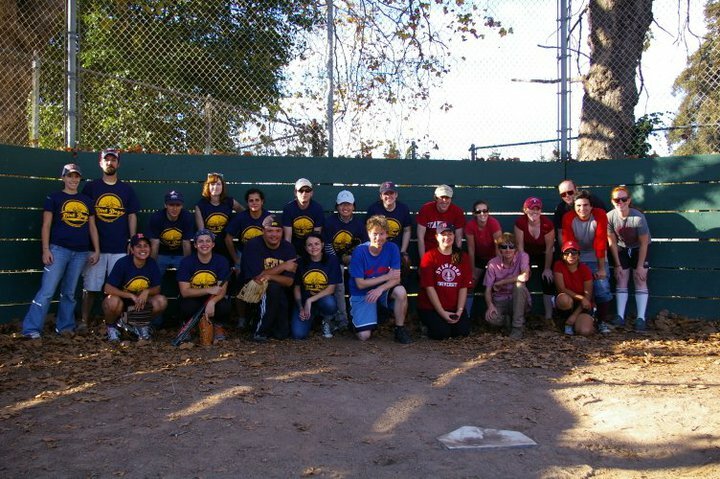 The true epic battle was over this last weekend — Berkeley archaeology and Stanford anthropology/archaeology met and played softball for the first time in what we hope will be a series. Berkeley had a strong home field advantage but Stanford rallied in the end and then much beer was had by all. Thanks to John Chenoweth for organizing this effort and to our fair colleagues from the South Bay for hauling up to Berkeley on a Sunday. 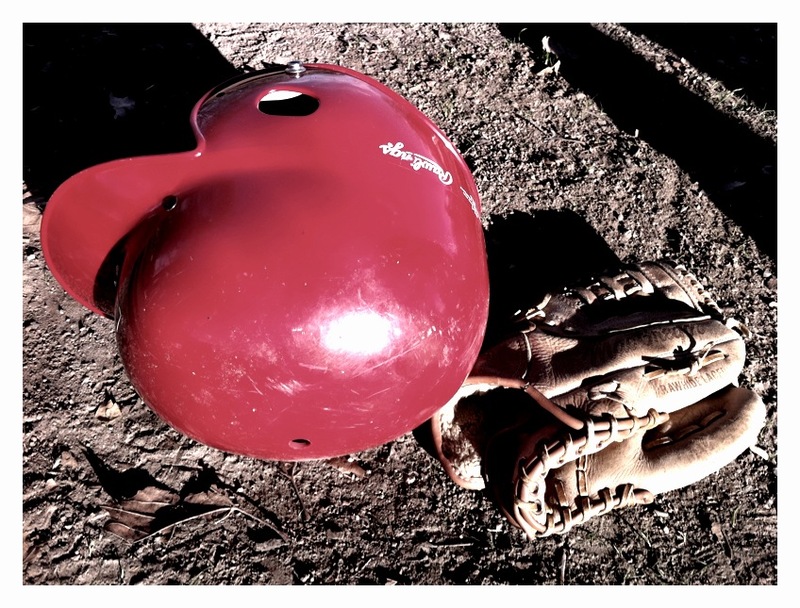 I didn’t play much as I was a bit under the weather, but now I’m gonna go look for a softball glove. I am joining several of my esteemed colleagues (see links to the right) in taking a brief hiatus from blogging at the end of a very busy semester. For a little background, we have a 6-year PhD program at Berkeley. I am coming up to the end of my 3rd year (half way through!) and, in keeping with the program’s schedule, I have written three field statements (also known as literature surveys) and a dissertation prospectus in time to take my oral examination. 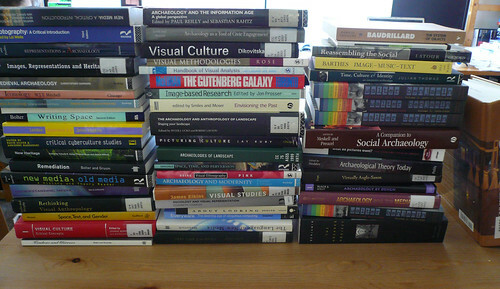 In theory, I will be tested over my knowledge of the three subjects I wrote about (visual semiotics, new media and archaeology, and place as recently imagined by archaeologists) but in practice, the field is pretty much wide open. I have four examiners–three archaeology professors and a professor from the school of information. They are all senior professors–at the top of their game–and I estimate that they have nearly 150 years of collective experience. Totally amazing and completely terrifying. I will open up with a 10 minute introduction of my work, which will be followed by questions from each of the professors, for a total of 3 hours. I have been studying for this, in theory, for the last three years. Lately I have been taking what little time I have outside of other classes, teaching, and, y’know, eating and bathing to study as best as I can. This weekend is all about tackling those books in the photo above, re-reading my field statements, and trying to stay calm. Hopefully I’ll be writing here again next Wednesday as a PhD Candidate, instead of a mere PhD Student. Time to get to it. I was able to nearly complete the Neolithic house by Cal Day, which was nearly a miracle. I would still like to add more pottery, obsidian, bucrania, and the like. I would also like to add embedded links to images of excavated materials like baskets and murals to show what the reconstructions are based on. I found this exercise to be highly interesting and useful, once I understood more or less how the building tools worked. As an excavator, I usually destroy rather than create, so building layers instead of removing them was nice for once. I also got to see the house in different light–sunrise, sunset, midday, night–the colors changed astoundingly. While the reconstruction isn’t perfect in that respect because there is ambient light that wouldn’t really be there, it was still educational. Ruth mentioned that she felt a little lost trying to identify the exact house where the reconstruction was. How would you remember which house was yours? How would an outsider figure out where to go? Does this imply some kind of markings on the outside of the houses as identifiers? I added a big column of smoke to help visitors find the house. Anyway, I probably will not have enough time between now and my orals to do much to the house, but I hate to put it aside. I need to make middens! And houses in disrepair! The list just goes on…. Each year we try to have an outreach program for Cal Day with offerings for children and adults. 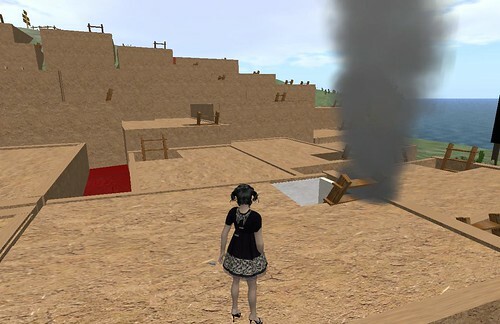 I’m actually double-booked–I’m supposed to help out with the Cheney House excavations AND with the Second Life demonstration. Oh well. 9–11 am | Archaeological Research Facility, 2251 College Ave. Learn how to make and decorate your own ceramics the way people did in the past. Clay available — bring your own kids! 10–10:45 am | Archaeological Research Facility, 2251 College Ave. Traveling with a traditional llama caravan bearing salt and tubers, archaeologists recently journeyed to the highlands of Peru to carry out an ethnoarchaeological research project. See a documentary of the experience and hear from the research director. For more information visit the project site online at http://www.mapaspects.org/caravans/2007_project. The Vikings are famous for many things, including their colorful, vibrant stories. Learn about the storytelling techniques they used, and then try retelling a Viking tale. Visit the museum and view its exhibits on Native California cultures, Rajasthan, Ancient Egypt, and more! For a better understanding of all the museum has to offer, take the docent-led tour at 1:15 pm, following the 1 pm Taiko performance. 11–11:45 am | Archaeological Research Facility, 2251 College Ave.
What is rock art and what can we learn about the images produced during the Paleolithic era? Find out! 11 am–noon | Archaeological Research Facility, 2251 College Ave.
Have you ever tried flintknapping? Stop by to see Berkeley archaeologists in action and feed your curiosity about how stones are made into tools. 11 am–1 pm | Archaeological Research Facility, 2251 College Ave. Try your brush and hand — literally — at making paints and helping paint a rock-art mural. Noon–12:45 pm | Archaeological Research Facility, 2251 College Ave. Hear about the innovative archaeological research at Çatalhöyük, Turkey, and discuss the findings of that project. Noon–2 pm | Archaeological Research Facility, 2251 College Ave.
No, not with mixers and synthesizers, but with actual rocks! Learn how archaeologists record rock art in this hands-on activity at Berkeley’s very own rock-art site. 1–1:45 pm | Archaeological Research Facility, 2251 College Ave. Hear about the ongoing historical archaeological research being done at the former Hansen’s disease (leprosy) colony on Molokai, Hawai’i. Debate over nuclear waste raises the concern that buried waste might not stay in place forever. How could waste sites be marked clearly for thousands of years to come? An anthropological study suggests we should be skeptical of the proposals for marking such sites, and explains what people think about cultural continuity and the persistence of things we make. 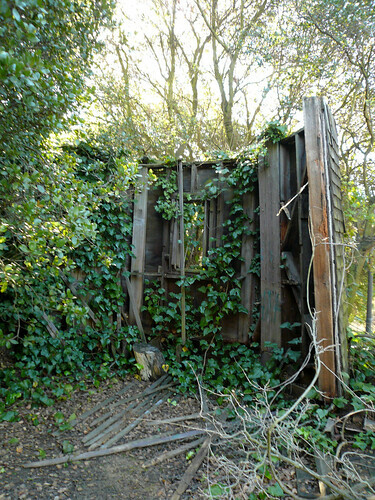 1–3 pm | Archaeological Research Facility, 2251 College Ave.
Don’t miss this chance to see Berkeley students working on their continuing investigation of the historic Cheney House archaeological site on campus. Visit OKAPI Island in the 3-D, virtual environment of Second Life, and explore the past and present of Çatalhöyük, a 9,000-year-old village located in present-day Turkey. The island, constructed by undergraduate research apprentices, features virtual reconstructions of the excavation site and multimedia exhibits of research data. 2–3 pm | Archaeological Research Facility, 2251 College Ave. Hear about the social and technological construction of Andean ceramics and how these artifacts can be used to answer important archaeological questions. Last week after class I went to hunt down the ruins of the observatory here on campus. 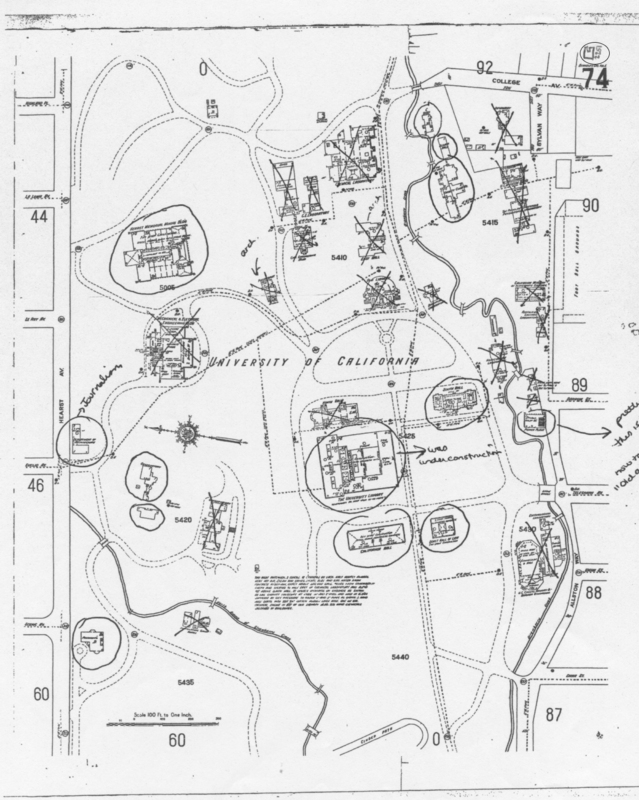 One of the assignments in Introduction to Archaeology was for the students to use a 1911 Sanborn Fire Insurance map of campus and use pedestrian survey to assess which buildings were still visible on campus. It’s a fun assignment and actually gets the students to open their eyes to the landscape that they blearily traverse each day. I’m guilty of the same–I had never checked out the ruins as they weren’t on my usual path up Strawberry Creek to the east side of campus. It was a sunny day in Berkeley, but the shadows of the huge Eucalyptus trees were still knife-edged, cold. I wrapped my scarf around my neck, walked up to North Gate, wound between the trees, and tramped up one of the small hills on campus to where a corner of the wooden building stood in a tangle of ivy and low trees. No wonder so many of the students failed to find it on the map. I kicked around the few empty 40s that were laying about, then headed back to my office. Louis Armstrong’s Dream a Little Dream came on my shuffle, which was a strange and lovely fugue from the usual punk rock and miscellaneous electronica. Steam was billowing out of the street grates and the London Plane trees were still muscular and bare, twisting up at the campanile. I might actually miss this place when I move.